The veteran holds almost every major quarterback record, including most total career touchdown passes (530), most touchdown passes in a season (55), most passing yards in a season (5,477), most career games with perfect passer rating (4), and most NFL MVPs (5). In fact, the only big quarterback records remaining are total passing yards (which he should easily top this season as he only needs 2147 yards to break Brett Favre’s record of 71,838), and the career regular-season wins record. The latter is unquestionably the big one. 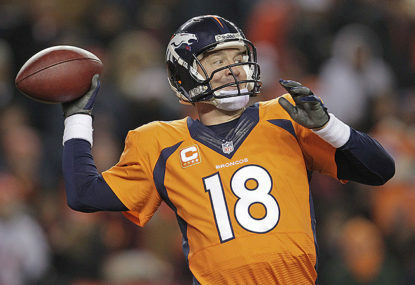 Mark my words: this season, Peyton has the career regular-season wins record firmly in his sights. No one stat matters more to an NFL quarterback than wins. Also held by Brett Favre, the record for the most regular season wins sits at 186. Going into 2015, Manning sits at 179, needing only eight wins this season to beat the record. By comparison, Tom Brady is at 160, while Hall of Fame quarterbacks such as John Elway, Dan Marino, and Joe Montana have 148, 147, and 117 wins respectively. After Peyton and Brady, the next closest active quarterback to the record is Drew Brees at 117. Comparing Peyton to earlier greats such as Fran Tarkenton, Johnny Unitas and Terry Bradshaw might be unfair as they had, generally speaking, fewer games in a season to work with. Still, even by the more agnostic stat of winning percentage, Peyton is almost untouchable. With his winning percentage of .699, he stands behind only Brady (.773), Roger Staubach (.746), and Montana (.713). So can Peyton get those eight wins needed to break the record? He absolutely should, but it won’t be as easy as it might have been in 2013 or 2014. The Denver Broncos have had a bit of a shakeup this offseason. Head Coach John Fox agreed to leave the team after four years at the helm. He joined the Chicago Bears, taking his offensive coordinator, Adam Gase with him. It’s hard to determine how much value the offensive coaching staff added to Peyton’s game, as he is generally given the authority to make the calls on the field himself, but a change in regime always has the potential to rock the boat for a quarterback. New head coach Gary Kubiak has stated that he wants to call the games from the sideline himself, but noted that Peyton will obviously have the opportunity to change plays at the line of scrimmage, and that they’ll be working closely every week together to build a gameplan. It’s hard to imagine that Peyton won’t have similar – if not more – authority to make calls on the field. He’ll manage. Talent wise, the Broncos took some hits on offence this free agency period. Peyton lost a major redzone target in tight end Julius Thomas. Thomas, a 6’5” monster and two-time Pro Bowler, enjoyed back-to-back 12-touchdown seasons with Manning under centre. He went where the money was this offseason, signing with the Jacksonville Jaguars. With Jacob Tamme joining the Atlanta Falcons, the Broncos re-signed Virgil Green and picked up Owen Daniels to fill the void. Daniels is talented, but doesn’t have the body that made Thomas such a strong redzone target. Green has Thomas’ size, but until this point has mostly been a blocking tight end. Both will have to compete this preseason to earn Thomas’ targets. Manning retains his best deep-threat in receiver Demaryius Thomas, and while the Broncos had to give him the franchise tag to do it, he should continue to play at a top level. His other potent weapon at wideout, Emmanuel Sanders, looks set to build upon his breakout 2014 season. The Broncos have no problem at wide receiver. At running back, the team will likely see another competition between C.J. Anderson, Montee Ball, and Ronnie Hillman, with Juwan Thompson in the mix, too. While C.J. Anderson seems to be the favourite, nothing is certain. If the Broncos can finally find a reliable halfback for Peyton to lean on, they’ll be able to ensure their quarterback remains fresh for the whole season, something that was clearly an issue in 2014. Not helping the running game situation are the changes the Broncos are seeing on the offensive line. Guard Orlando Franklin has left the team in favour of the San Diego Chargers, and the team is yet to re-sign centre Will Montgomery despite his apparent fit in Kubiak’s offensive scheme (Montgomery became familiar with Mike Shanahan’s offence during his time in Washington, and Kubiak’s offence is likely to be similar). The new signing at centre, Gino Gradkowski, has some major question marks of his own, too. Losing Franklin will hurt, as he was largely considered the best performer on an otherwise declining offensive line. Still, Ryan Clady will provide stability at left tackle, and moving Louis Vasquez back to right guard should help him get back to form and improve the OL’s overall performance. The OL must improve in 2015 because more than anything else Peyton’s health will be a major factor, and how the team manages his practice reps and playtime will ultimately contribute to their end-of-season win tally. Whether that means a greater reliance in the run – highly likely given what we know of Kubiak’s offensive style – or even giving more opportunities to Peyton’s understudy, Brock Osweiler, in the regular season remains to be seen. It’s not surprising that Peyton’s health is a major point of focus for his coach. The Broncos have certainly lost some of their talent this offseason, but they are working with Peyton to build an offence around his strengths. Even with the challenges detailed above, it’s not difficult to imagine Peyton hitting 10 or more wins come next January, especially so considering the state of the AFC West. Assuming health – which is not a safe bet with Peyton – it’s very likely we’ll see Peyton break another two major NFL records in 2015, including total career yardage and, more importantly, career regular-season wins. In doing so, he’ll be adding to what can only be described as a near-insurmountable NFL legacy. Exactly the way I’d want a legend like him to go out.